I still dream of you, Brooklyn, of my first time. First night in the country, late arrival due to a major airplane delay, I decided to explore the hotel neighbourhood late at night, where I met you. No more than a nanosecond was enough for the two of us to know that we were made for each other. You smelled so nice, you looked so good, I wanted you more than anything ever before. Slowly I began to unwrap you… there you were, a delicious baguette, just bought in a deli, at half past eleven in the evening. Subway excluded, finding tasty warm sandwiches that late would come close to mission impossible in Brussels, as most sandwich bars stop their services after lunch time. 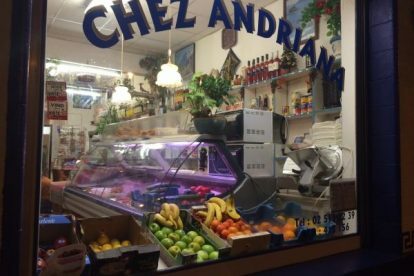 If a closing time a little earlier, 19:00, also works for you, Chez Andriana comes to the rescue. A bit off the beaten track and not well known to tourists, but still at walking distance from the center and frequented by a broad range of locals. The place is owned by a cordial Greek family that also sells Greek food like wine, ouzo and some dairy products, but their highly addictive signature sandwich is their greatest asset: crumbled turkey or chicken with a delicious homemade eggplant sauce, and a nice alternative could be a creation with meatballs and tzatziki sauce. And when the owner makes sure to separate hot food from drinks, preventing your soda from getting heated by your sandwich, you know you’re in good hands.